From the dense vegetation of the Amazon rainforest to the open sands of Atlantic beaches, Brazil encompasses a vast territory of more than 8.3 million square kilometers (3.2 million square miles). It is the largest country in South America and the fifth largest in the world. Some 200 million people live in Brazil, and nearly 85 percent of them are in cities. Among those cities, São Paulo reigns supreme. With a population of more than 20 million—roughly 10 percent of Brazil’s total population—São Paulo and its surroundings ranked as the tenth largest urban area in the world in 2014. The city is no newcomer to the list. 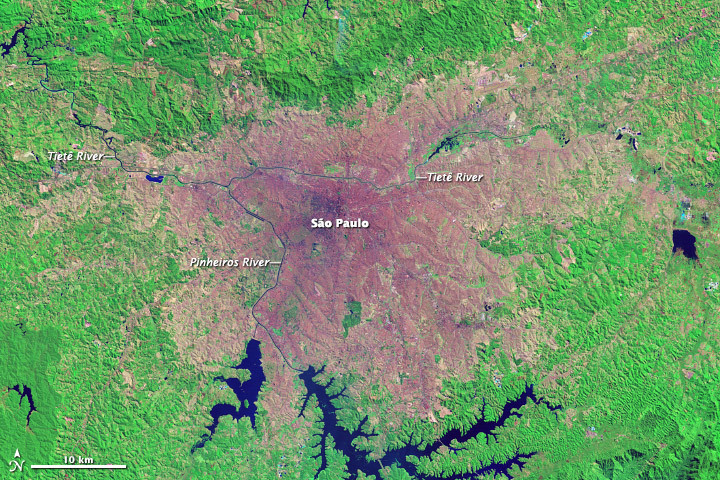 For two decades starting in the 1980s, São Paulo was the fourth largest city in the world. As the city has grown, its suburbs have spread and its urban core has become denser. 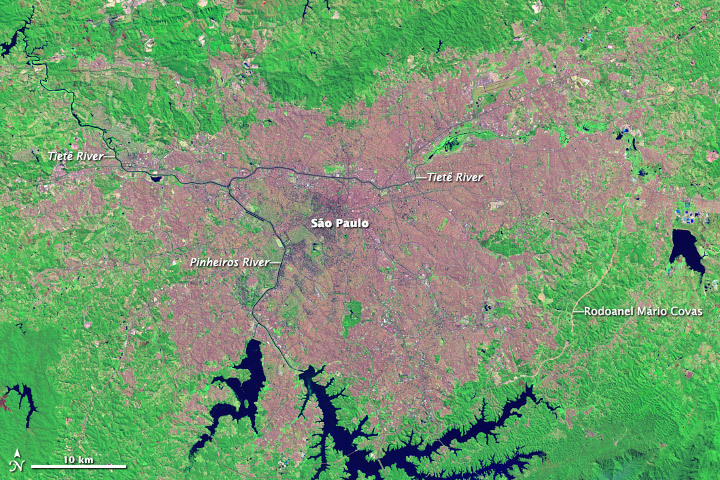 The Landsat satellites captured this change in these two false-color images. 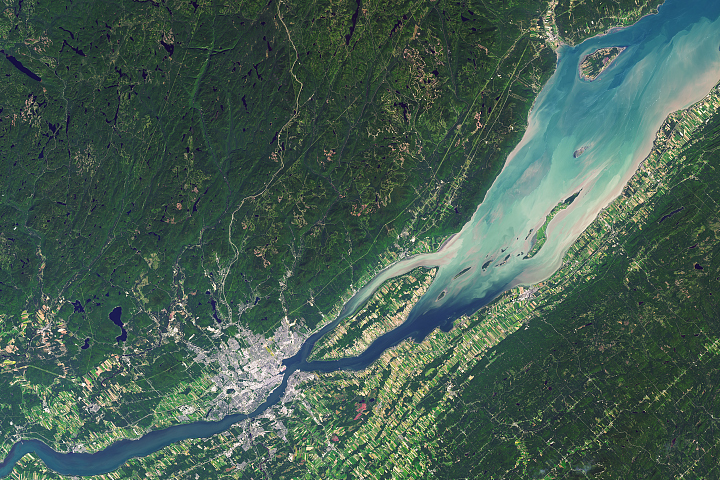 Landsat 5 acquired the top image on August 6, 1986; the lower image is from Landsat 8 on September 1, 2013. 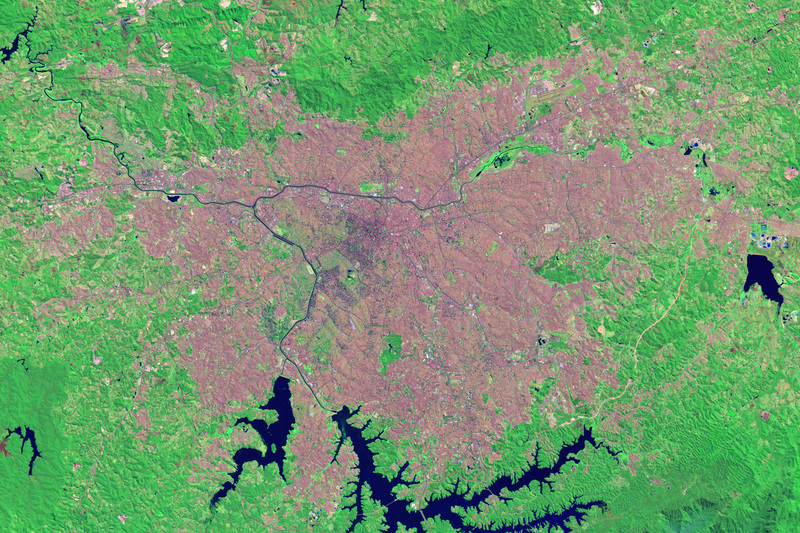 In both images, urban areas range from tan in the suburbs to pink and purple in the most densely built areas. 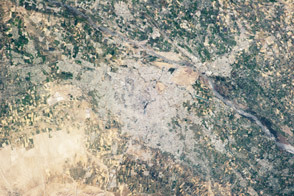 Plant-covered land is green, and exposed earth is tan (like the urban areas). Turn on the image comparison tool to see how the city has grown over the past two decades. 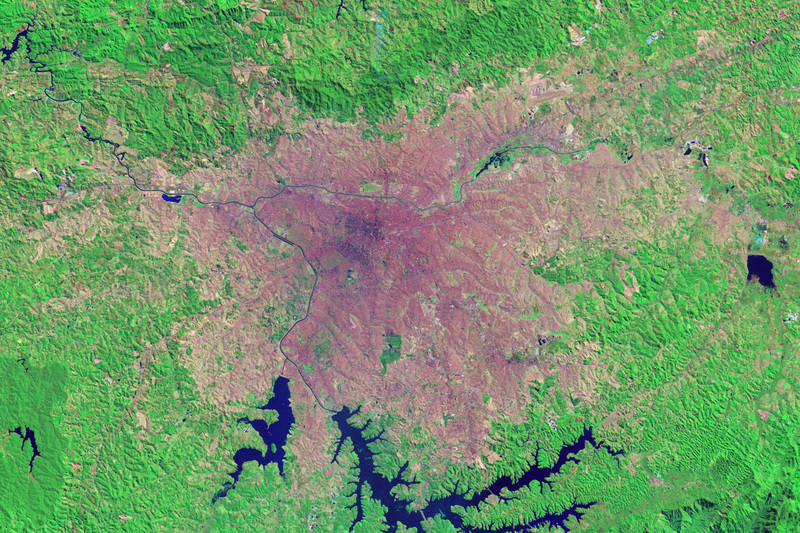 In 1986, São Paulo radiated out from a dense urban core, with the city getting gradually less dense. By 2013, the densely built area had spread southwest along the Pinheiros River. The most notable change, however, is the spread of the suburbs, where growth has been fastest. In the past decade, São Paulo’s suburbs added 1.7 million people, while the city core added 800,000 people. Much of the suburban growth happened in favelas, which sprang up as people built shelter on steep hillsides or floodplains—areas that were unoccupied because they had been deemed inappropriate for construction. An estimated 20 to 30 percent of São Paulo’s population lives in favelas, which pose a challenge to municipal government because these unplanned communities often lack connections to sewage services, water, and electricity. 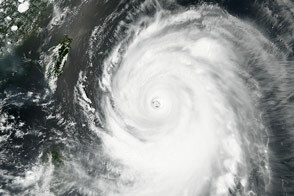 The other notable change in the images is the addition of a large ring road, the Rodoanel Mário Covas. Scheduled to be completed in 2015, the road adds a much-needed pathway around the city. Prior to its construction, the only way from one side of the city to the other was through the city center, resulting in traffic problems. The road is visible southeast of the city in the 2013 image. Nearly 10 percent of Brazil’s population lives in São Paulo, which ranks as the tenth largest city in the world. Barcelona Field Studies Center (2013, May 5) São Paulo growth and management. Accessed July 3, 2014. Demographia (2014, May) Demographia world urban areas. Accessed July 3, 2014. Forbes (2013, July 12) All you need to know about São Paulo, Brazil’s largest city. Accessed July 3, 2014. New Geography (2012, August 29) Evolving urban form: São Paulo. Accessed July 3, 2014. Planum São Paulo, the challenge of the favelas. 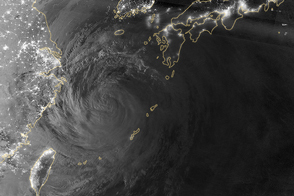 Accessed July 7, 2014. The Rio Times (2011, November 22) The favela policy in São Paulo. Accessed July 7, 2014. University of São Paulo Urban slum reports: The case of São Paulo, Brazil. Accessed July 7, 2014. U.S. Central Intelligence Agency (2014, June 23) The world factbook: Brazil. Accessed July 7, 2014. Urbanization Project (2014, April 3) 30 cities from 200 years agoÃ¢â¬Â¦and where they are now. Accessed July 3, 2014.